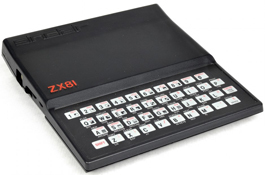 The Sinclair ZX81 was the successor of the ZX80 and can be regarded as an evolution of it. Many improvements were made including a more robust case, new colours (and matching peripherals) and the elimination of the ZX80's infamous screen flicker. Now with an 8K ROM (compared to the 4K of the XZ80), the ZX81 could now handle floating point numbers and data files on cassette, plus it had an additional 30 functions in BASIC and some instructions to drive the Sinclair thermal printer. A much higher level of integration meant lower production costs and a reduction of chips on the main board from 21 to just 4 – the ROM, Z80A CPU, 1K RAM and the Ferranti custom-made Uncommitted Logic Array (ULA) - it was as simple as that. The keyboard was still formed by an under printed plastic, but this one was made of non-reflective material. 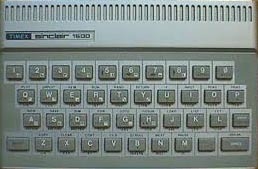 Even with this slight improvement it was quite horrible to use, with some of the keys - in true Sinclair fashion - sporting up to 5 functions. With only 1K of RAM, the 16K RAM pack quickly became essential. The US company Timex were contracted to produce the ZX81 at its Dundee factory in Scotland. Sinclair used its relationship with Timex to sell a re-branded ZX81 as the Timex-1000 in the US. 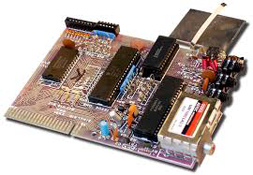 A new version of the ZX81 with a built-in 16K RAM pack, fitted into what would be a Spectrum style case was also sold (only in the US) as the Timex Sinclair TS-1500. With a better keyboard (just) and the extra RAM it was surprising that this model was not very successful. Like the ZX80, it was still available as a kit, or ready assembled. The machine was a big success in Europe - even without colour, sound or even a joystick! Local price at launch: £49.95(kit-form) - £69.95 (ready-built). To save money, the computers did not have a socket for expansion. Copper tracks led to the edge of the circuit board and memory expansion packs (very necessary with only the 1K of RAM built in) had to grip the board to make a connection. To the infuriation of users, the slightest knock, or even a key press made too hard would crash the system losing hours of carefully typed in program! The knock-on effect of the crashes nowadays though means that most ZX81's now have burnt out ULA's and replacements are as rare as rocking horse droppings. The Z80A CPU and the TV modulator are still available, but the other chips are not, making repairs to the electronics of the ZX-81’s almost impossible. In terms of the most common problem (the damaged ULA), the symptoms of are a very dark screen and barely visible flashing cursor. Often though, with both the brightness and contrast turned up to full levels on the TV, the ZX81 is still usable. Another very common problem with all Sinclair models using cassette leads are loose clamps inside the connector sockets. This causes the leads to slip out of the socket, or move around affecting program loading or saving performance. I usually have spare sockets in the Sinclair Sales pages of this Sinclair section of the website, but if your soldering skills aren't up to removing the old and fitting the new then a gentle push with a small flat blade screwdriver is often successful in re-tensioning the spring contact. For non-working keys, keyboard membranes are still available at SellMyRetro.com, but they are notoriously difficult to fit. All traces of the old self adhesive membrane have to be carefully removed and the replacement fitted completely flat and in exactly the right position. The adhesive is very strong and you get only one chance to get this right! Another option is to try and buy a complete top assembly which can occasionally be picked up from America.